I often say both to myself as well as aloud, "I don't know how they do it." I'm referring, of course, to all those teachers out there who don't work in cooperative preschools, and especially those with a play-based classroom that operates around the idea of "stations" or "centers." For those who don't know what I'm talking about, be assured that I had no idea either until the first time I actually set foot in such a school. The set-up made such immediate sense to me, however, that I promptly enrolled my daughter for the following year. I don't know what I expected school to look like for two-year-olds, but the moment I saw how the Latona Pre-3's Cooperative Preschool classroom worked, a room featuring a half dozen stations -- blocks, sensory table, art, table toys, dramatic play, library -- with which the children were able to freely interact, or not, I knew we'd found our home. 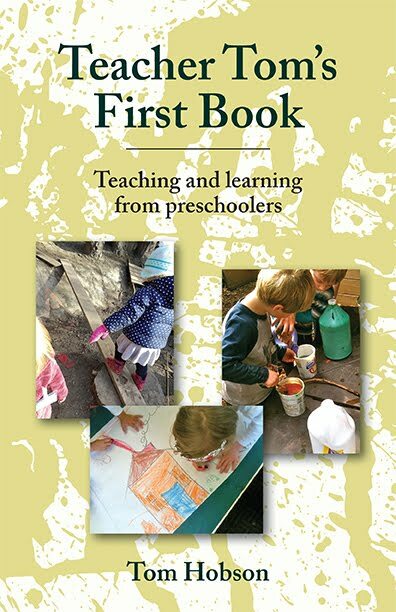 Back in April, I wrote more philosophically about this classroom approach, but a reader asked me recently for tips of the "nuts and bolts" variety, especially when it comes to being the adult responsible for guiding or facilitating the "free play" without taking it over and, well, rendering it not so free. I should mention that I'm writing primarily about our indoor stations here, but all the same principles apply to our outdoor stations as well. Since we're a cooperative, I have the benefit of anywhere from 5-12 assistant teachers, parent-teachers, in the classroom with me on any given day, depending on the age of the kids and the status of maternity leaves. Each of these assistant teachers, then, are assigned specific roles within the classroom on a rotating basis, most of which involve facilitating one of our stations, which I've prepared in advance. As our parent-teachers arrive, I try to give each one a quick briefing about how I imagine the children will choose to engage with the activities, a head's up about any typical behaviors for which to be on the lookout, and a tip or two about how they might want to extend the play should things either get extra exciting or lose momentum. I then try to always finish my instructions with a reminder to, above all else, "Let the kids make it their own." For many parent-teachers, that's the hardest part: getting out of the way, dropping an adult agenda or fixed idea about how things ought to go. For instance, we all think we know what's going on when we find easels, paper, paint, brushes, and a bowl of fruit on the table. Of course, we're working on "still life" paintings, and that invitation is indeed implied in this particular collection of materials, although it is by no means the only invitation there. 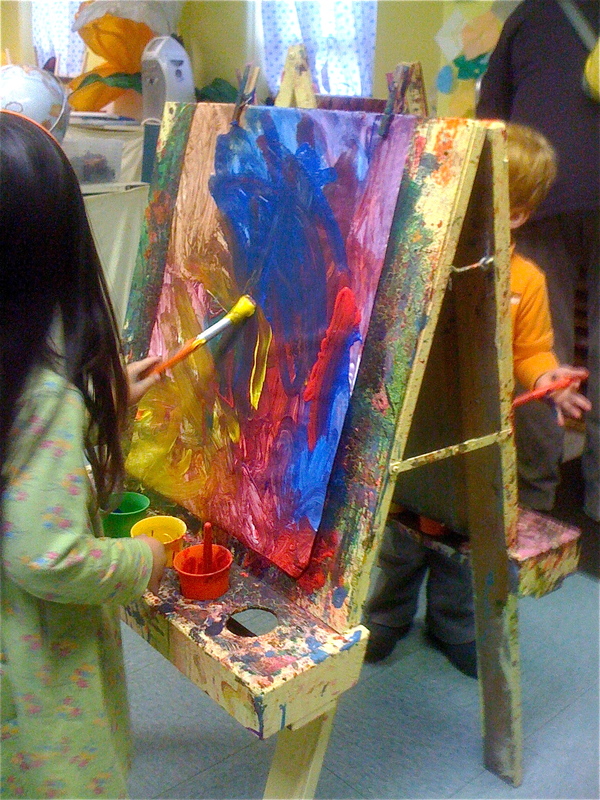 This is also an invitation to paint the fruit itself, to use the fruit to apply the paint to paper, to finger paint, to mix colors; it is an invitation to make art, but also to engage in a sensory exploration, scientific experiments, storytelling, or socializing. When we make the mistake of saying, "Oh look! Today we're painting pictures of fruit!" we are, in effect, withdrawing all those other invitations. No, instead I encourage our parent-teachers, if they must say something, to simply list the materials they see before them, giving them names, but not necessarily purposes, and just so long as the children do not endanger, molest, or otherwise inflict themselves on others, they are free to accept any and all invitations that appeal to their curiosity. This doesn't mean that the teachers role, then, ought to be limited to merely standing back, keeping things tidy, the children safe, and the materials handy, although some of our parent-teachers chose to do it like that, and it's a perfectly fine way to facilitate the play. Some of us, however, are there to play with the kids. Naturally, we need to guard against taking over the play, but there is often a lot to be gained from a teacher who role models active, creative engagement. I like to narrate my own thought process as I perform my own experiments: "I wonder what will happen when I put this block here," "The rice is flowing through the top part of the funnel and coming out of this little hole -- if I put my finger here, it stops," "I'm putting all the red ones together." Usually, my goal is to get things going before stepping away, although many parent-teachers are quite skilled at continuing to play with the children, almost in the role of a slightly older, wiser playmate, not commanding the action, not yanking them out of their flow with questions, but rather being one of the features of the activity. Others of us approach the task in a more hand's off, yet still fully engaged manner, carefully observing the children, then finding ways to assist or support them in accomplishing or discovering what they seem to be striving to accomplish or discover, often simply by engaging in what's sometimes referred to as "sportscasting" or narrating what you see unfolding before you: "Sally is making holes in the play dough with her thumb," "You are turning that puzzle piece around and around to see if it fits," "I see 1, 2, 3, 4, 5 bears in your box." I often find these parents cheek-to-cheek with children, wondering and puzzling together. Sometimes a parent-teacher finds herself all alone at her station either due to the natural ebb and flow of free play or because the invitation is simply not enticing enough on this particular day. The temptation, often, is to seek to liven things up, perhaps by adding bells and whistles or by becoming more overt in re-issuing said invitation, and that's all well and good. Others, however, recognize that they are now the proprietors of a calm, quiet oasis, a place for a child or two to take a break from the action, a valuable thing sometimes in a bustling place like ours. There are times, however, when this ebb and flow are anticipated parts of an activity. For example, when we play with ice in the sensory table, there is usually an initial surge, then as fingers grow numb, so does the enthusiasm. That's the moment when the parent-teacher will introduce our box of gloves. As the interest in that dies down, we break out the rock salt to sprinkle on the ice, an activity that accelerates the melting process. As the salt burrows holes in the ice we bring out the pipettes and liquid water color that can then inject into the holes, filling the ice with ribbons of color. As our play time grows short, our sensory table has become a pool of colored liquid, rainbow icebergs, and undissolved rock salt, having passed through, along with the kids, a wide variety of stages and phases. Most of our stations are of the open-ended variety, although every now and then we'll take on a project with a goal. For instance, last week our workbench station was engaged all week in assembling our new outdoor furniture, which involved following instructions, puzzling things together, and using Allen wrenches to tighten lots of screws. In that case, my instruction to the parent-teacher was, "Just start building the stuff and as kids drop by to see what's going on, include them." 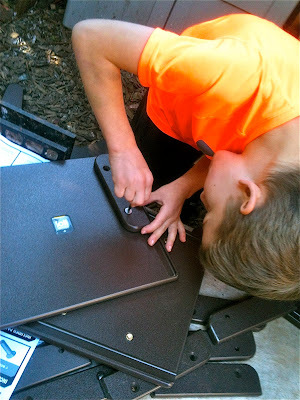 I often think of these kinds of stations the way I think of parents including their children in preparing dinner or working on the car out in the garage: real participation in real projects. I suppose the way non-cooperative teachers handle all this is to either offer fewer stations at any given time or to let some of them sort of "run" themselves, and I'm sure that works out just fine, but I find I've become really quite reliant upon having all those extra adults in the room with me, working to make their station the best it can be. Most of all, I think, I enjoy how these stations, these invitations to play, so often take on part of the personality of the parent-teacher involved. We often leave many of our stations the same for more than a single day. For instance I'll set up the same collection of blocks and toys from one day to the next, or the sensory table will contain coffee beans all week, or we'll continue working on the same glue collage day-after-day. But that hardly means they are the same activities. For one thing, the children have the opportunity to continue building upon what they learned the day before, but an inevitable part of the difference comes from what the parent-teacher brings to their role as facilitator and guide, because there are as many ways to do that as there are teachers.